Rides with the Sun, oil on canvas, 20 x 30. 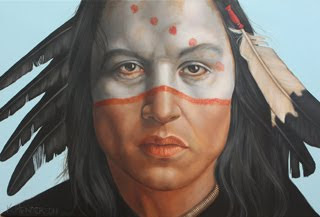 American Indians painted their faces for decorative purposes and for protection against the wind, sun, snow and insects. Designs of various kinds were used to designate membership in certain societies, to prepare for ceremonies, to mark achievement and to mourn the dead. When used for personal ornamentation there was no guide to the way the paint should be applied beyond the fancy of the wearer or for personal identification. 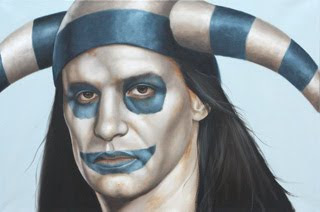 If a warrior had his face painted when he went on a raid into an enemies camp, he would change the face paint after the raid so the spirits of the dead would not recognize him and follow the warrior back to camp. 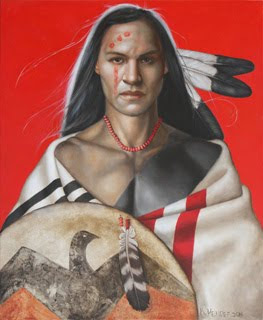 Although the majority of my American Indian paintings are portraits of the Plains Indians, I also love painting the Pueblo Koshari. They are a Hopi Clown that perform during spring and summer rituals. As a Sacred Clown, they are the keeper of tradition and values. Although their purpose is to amuse, the humor often pokes fun at individuals, leaders and attitudes that seem aberrant to the tribe. 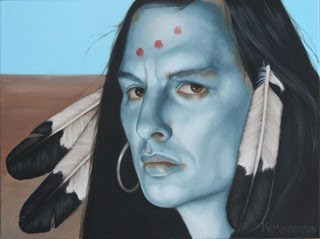 Sacred Power is oil on linen, 30 x 36. The image on the shield is the thunderbird. In many legends this bird brings Wind and Thunder with the beating of his wings. Some myths state that the sound of thunder is the sound of spirits warring in the sky. Do you want to get an inexpensive printed image of my painting "Painted Dreams" along with some great feed for your horse? For the past few years Ranch-Way Feeds has been using art work to decorate their feed sacks. 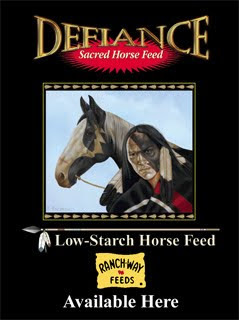 They will soon be coming out with my painting "Painted Dreams" on their Defiance Sacred Horse feed bags. I'm really excited about it. I feel like I've come full circle. Many years ago when I first started my art career I did the art work on feed sacks for a local mill in Muskogee, OK. 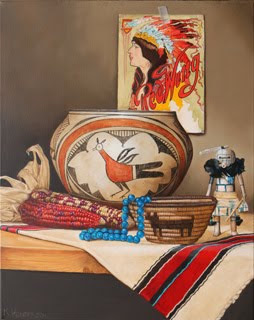 I was awarded second place at the Hubbard Museum's Biennale Grande in Ruidoso, NM. I didn't get to attend the opening because of bad road conditions. You have until April 11th to see the exhibit.